A 3D Rendering of Mount Fuji with Sentinel 2 Satellite Imagery and ASTER DEM in ArcScene. ArcScene is for local scenes and ArcGlobe is for global. Find out more differences between 3D software. ArcScene and ArcGlobe are both part of the Esri family of GIS software. Instead of the 2D viewing that we are accustomed to in ArcMap, ArcScene and ArcGlobe both specialize in 3D visualization. With a 3D Analyst extension, these 3D GIS software can display neat 3D effects. But how are they different from each other? When you have a local area you want to view in 3D, then ArcScene is often the ideal choice. For example, you can see the topography of a mine site because of its small area and planar projection. Another key difference is how vectors are not rasterized. Because vectors remain vectorized in ArcScene, this allows the user to freely extrude their symbology and set base heights. If you have LiDAR data, ArcScene can now integrate LAS datasets and add z-value elevations in your scene. If you have photogrammetric data, it also has the capability for stereo viewing in anaglyph mode. Lastly, in ArcScene, you can perform 3D analysis such as steepest path, line of sight and profile graphs. Although you can perform these types of 3D operations in ArcMap, it really just makes more sense when you can see it all in three dimensions. As you’re about to find out, ArcGlobe doesn’t have the 3D analysis tools that are equipped in ArcScene. While ArcScene is for local scenes, ArcGlobe delivers more of a global perspective. This is why data is always in WGS84, in a cube map projection and geodesic in nature. 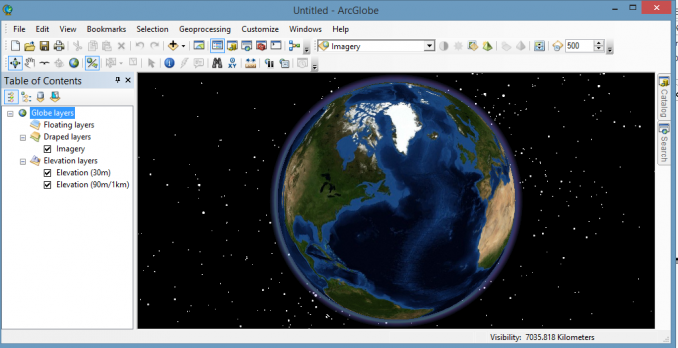 While ArcScene maintains vectors as symbols, ArcGlobe is a raster-based application. Actually by default, ArcGlobe rasterizes features when you add them in the application. In this same respect, it also caches data so when you zoom to different scales, it shows different levels of detail. It’s almost as if features are draped on the surface with representation symbology. Furthermore, ArcGlobe can consume Google Earth KML, terrain data sets and ArcGIS services. If you want to display the extent of a country, you will most likely use ArcGlobe. Unless the country is small in area, this is an ideal usage for wide regions ArcGlobe is meant for. Both 3D software specialize in two separate aspects. The primary difference is how they work at different scales. You are going to use ArcScene when working at a local scale, especially if you want to analyze your 3D data. It is better equipped with tools such as line of sight and terrain profiling. Because your data remains in vector format, you can extrude features and set base heights. ArcGlobe is better suited for global viewing of the Earth. At a national extent, ArcGlobe is ideal because how it caches data. You can freely zoom to different levels, where it renders your rasterized features. Now, ArcGIS Pro is the newest member of Esri’s 3D family software to accompany ArcScene and ArcGlobe. With ArcGIS Pro making rapid strides in the 3D GIS world of visualization, will there still be a need for ArcScene or ArcGlobe at all?